Israel asked EU countries to prevent flotilla vessels from leaving from their ports and to prevent their citizens from taking part, turning its attention to the diplomatic front as the wave of boats aiming for Gaza's shores continues to grow. The Naji el Ali is expected to arrive from Lebanon soon, and two vessels from Iran organized by the local Red Crescent with support from the regime in Tehran. According to information obtained by the security establishment, Hamas is talking about no less than 10 flotillas by October 2010, the end of Ramadan. 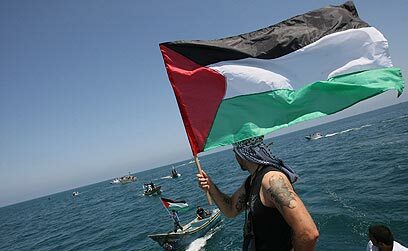 All the flotillas aim to take advantage of Israel's diplomatic straits following the lethal raid on the last flotilla on May 31 in which nine activists were killed on the lead vessel. The new initiatives are based in Lebanon, Sudan and Iran as well as Britain, Norway, Turkey and other European countries. The organizations working to lift the Israeli blockade on the Gaza Strip cooperate amongst themselves. Some even receive government support, at least in Lebanon, Sudan and Iran, and possibly also in Turkey. The significant funds are obtained mostly via contributions from Muslim communities around Europe and throughout the world. Among the hundreds – if not thousands – of people signing up to participate are public figures. Their aim is to create an even larger flotilla than the one headed by the Turkish vessel, the Mavi Marmara. On Monday, Israel told the EU that it should act to prevent the organization of flotillas on its soil and stop its citizens from working against Israeli interests. The message was part of ongoing dialogue between Israel and the EU led by Tony Blair, the Quartet's envoy to the Middle East who is also representing the EU, in an effort to ease the blockade. According to Foreign Ministry sources, the message was received well by EU leaders who want to avoid confrontations – as long as it is possible to ease the blockade by diplomatic means. However, at this stage no practical steps have been taken by European governments to stop the organization of flotillas. Meanwhile, the security forces are preparing to receive the three vessels expected to reach Gazan shores soon. Israel's policy, as declared by Defense Minister Ehud Barak and Prime Minister Benjamin Netanyahu, is not to allow the boats access to Gaza, so that Gaza does not become "a vanguard Iranian port." After the controversial raid on the Marmara, forces are training in preparation for halting the flotilla boats. The Lebanese boat is expected to arrive first, following by the vessel which left Iran Monday, plus a second vessel from Iran which will arrive in the weekend. The Lebanese boat is expected to carry dozens of journalists and European pro-Palestinian activists including members of parliament. The vessel was organized by two groups: Free Palestine, and Reporters without Borders. The vessel is reportedly carrying humanitarian aid and equipment for schools in the Gaza Strip. The Iranian vessels are carrying contributions from the Iranian people and aid workers. The contributions are being collected by the Iranian Red Crescent. These are the forerunners of what appears to be a wave of boats, expected to peak at the end of Ramadan when organizations such as Free Gaza and Viva Palestine hope to organize a flotilla of 10 to 15 craft. This flotilla will be called "Freedom Fleet II". One of the central activists, Iyad el-Sarj, who lives in Norway and is known to Israel as the founder of the campaign to lift the Gaza blockade, believes that the large flotilla will lead to irreversible change in Israel's sea blockade policy. See all talkbacks "Israel to EU: Stop your citizens from joining flotillas"